This is the first in the series of articles on the growing rivalry between the U.S. and China and its implications on the two Koreas and East Asia. The first installation deals with President Barack Obama’s re-election, his foreign policy agenda and its impact on the region. ― Ed. U.S. President Barack Obama has little time to bask in the euphoria of his re-election as he faces an array of daunting foreign policy challenges including an increasingly assertive China, nuclear-armed North Korea, and the still-volatile Middle East. With the campaign pressure now off, the first African-American U.S. president could exert a more active and flexible diplomacy to maintain the country’s global leadership, while adapting to its diminishing global power and fiscal constraints, experts noted. The toughest task internationally for Obama may be coping with China, which will soon finalize its fifth-generation leadership lineup led by current Vice President Xi Jinping. Experts largely concur that Obama will continue to walk the fine line between competition and cooperation, rather than taking an outright confrontational approach considering that Washington struggles domestically to address a fiscal deficit, sluggish economic recovery and high unemployment, not to mention other security quandaries. “During the election campaign period, Obama, along with his Republican challenger Mitt Romney, remained quite conservative over China, so they wouldn’t seem weak. But that is all election strategies and rhetoric. 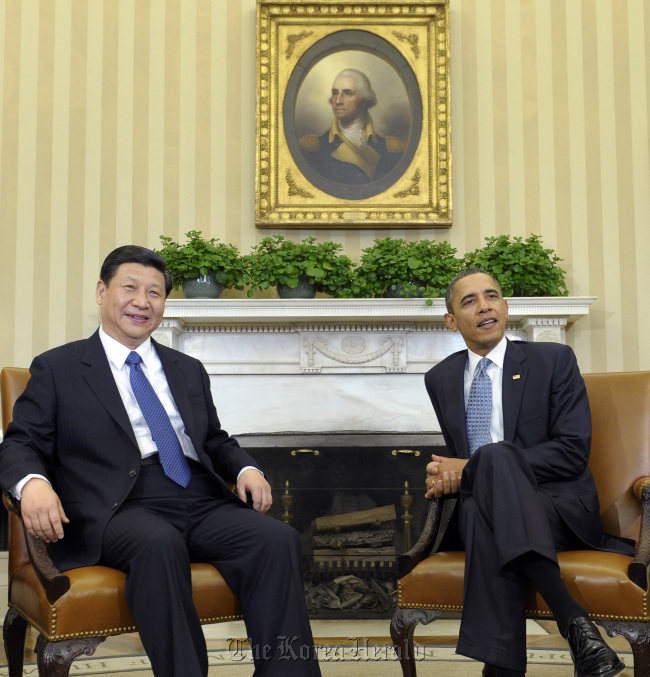 Well aware of the reality, Obama will not make affairs concerning Beijing more complicated or aggravated than now,” said Chun In-young, professor emeritus at Seoul National University. However, some cautioned that the Sino-U.S. rivalry could deepen as Xi may seek to project the image of a strong leader tasked with reviving Chinese pride based on the Asian power’s growing economic and military strength. “Unlike Hu Jintao, Xi entered his adulthood as the country’s efforts for reform and openness were in full bloom. Thus, he could more actively accept the changing tide of the world,” Suh Jin-young, professor emeritus at Korea University, told The Korea Herald. The changing security landscape in East Asia has been a source of concern for South Korea and other regional stakeholders as China moves to fix what it sees as being unfair in the international order that the U.S. has fostered since the end of World War II. The two powers’ competition for regional supremacy has sharply increased since early this year as Washington unveiled its new strategic guidance to rebalance its military priorities in the Asia-Pacific rising as a fulcrum of global politics and economy. In response, China has continuously upgraded its military tactics and weapons systems. In September, China put into service the 67,500-ton Liaoning aircraft carrier, showing off its maritime ambitions, which the U.S. apparently views as part of Beijing’s anti-access/area-denial strategy, along with its development of increasingly sophisticated missile technology and stealth fighter jets. “Since the late 1990s, China’s defense industries have accelerated their R&D amid China’s shifting geostrategic interests, widening operational requirements of the People’s Liberation Army, and comprehensive defense reforms,” said Michael Raska, research fellow at the S. Rajaratnam School of International Studies, Nanyang Technological University. Another security challenge Obama faces in the region is North Korea, who some experts presume could launch provocations such as testing missiles and nuclear arms should the U.S. not pay due attention to the fledgling leadership in Pyongyang. “For about 26 years, we have been struggling with North Korean nuclear issues. In the process, Seoul and Washington alike are fatigued over the pattern of Pyongyang launching provocations and winning rewards,” said Nam Chang-hee, political science professor at Inha University. The North Korea conundrum, as always, will be affected by how concerned parties such as South Korea and China move to resolve it. But Obama is expected to maintain a strict reciprocal stance, raising concern over difficulty in policy coordination between Seoul and Washington. China is expected to maintain the status quo and stability on issues concerning its impoverished ally, analysts said. “Seoul and Washington are expected to find a way to block North Korea from additionally developing nuclear technology and transferring fissile material as well as the technology,” said Nam. Concerning its relationship with Japan, Washington is expected to continue to cement its alliance with Tokyo as it seeks to share the security burden in line with its belt-tightening measures. Japan has been the centerpiece of America’s regional power projection efforts. The Asian power is expected to hold elections within months. Shinzo Abe, a security hawk and leader of the Liberal Democratic Party, is expected to return to the premiership. “U.S.-Japan relations will surely improve in the years to come. As the Democratic Party of Japan took power in 2009, ending a half century of almost unbroken LDP rule, some cracks in the alliance emerged. But with the LDP, their ties would become stronger,” said Lee Choon-kun, security expert at the Korea Economic Research Institute. Washington may take a cautious stance on Japan becoming overly nationalistic and conservative, but it would continue to use Japan as an influential partner in its regional hedging strategy against China, said Nam of Inha University. But Japan’s rightward shift means it would take a more aggressive stance on its territorial spats with South Korea and China, and continue to deny its wartime atrocities, observers pointed out. So, Washington may have to defuse a possible escalation of tension between Seoul and Tokyo over territorial and historical issues, they noted. The U.S. has been seeking to forge a broader triangular military alliance with South Korea and Japan, but the historical animosity stemming from Japan’s 1910-45 colonization of the Korean Peninsula has gotten in the way of the neighbors’ practical cooperation. Earlier this year Seoul sought to sign a military intelligence-sharing pact with Tokyo to better deal with North Korean threats, but failed in the face of strong opposition from the public still harboring bitterness over Japan’s brutal colonial rule. For South Korea, the next several years in the relationship with the U.S. are crucial as Seoul should revise a nuclear energy pact with Washington, which will expire in March 2014, and retake wartime operational control in December 2015. To ensure smooth intelligence cooperation, the allies are now in consultation over how to manage their combined forces in the event of an armed conflict, as the current Combined Forces Command is to be dissolved after the OPCON transfer. They are currently mulling over establishing what analysts call a mini-CFC, which critics argue would restrain South Korea’s wartime command authority. The two allies are also in talks over mapping out a plan to deal with localized North Korean provocations. The bone of contention is the scope of a counterattack in the case of a provocation. Washington apparently wants Seoul to practice more restraint, as a counterstrike could escalate into a full-blown war and could drag it into the feud amid anti-war sentiment in the U.S. following a decade of war in Iraq and Afghanistan. Another issue is Washington’s repeated call for an increase in the amount Seoul pays toward the upkeep of U.S. troops in Korea. The U.S. has reportedly asked Seoul to increase the share of the costs it pays to 50 percent from the current 42 percent. Washington also wants Seoul to join its global missile defense program. While Japan has deepened missile shield cooperation with the U.S., Seoul has been reluctant so as not to provoke China and North Korea. Seoul has recently unveiled its missile interception concept, raising speculation that it has taken a step closer to the U.S.-led missile defense program. Seoul officials denied it, saying that Korea’s program is a low-tier defense shield fit for the country’s terrain. Last, but not least, Iran is another conundrum for Obama. Although Washington has led global sanctions against Tehran, there has not been much headway in negotiations to persuade the Islamic Republic to renounce its nuclear programs. America’s anti-Tehran sanctions had negative ramifications for Seoul. South Korea, which has long called for international support on peninsular denuclearization, had to join the U.S.-led sanctions, which in turn hurt ties with Tehran, an increasingly important trade partner. Along with Iran, the U.S. should also restore support from Muslim society. Anti-American sentiment has spread across the Muslim community with anti-Islam videos going viral on the Internet in September. Volatility in the Middle East, coupled with America’s financial constraints could hamper its efforts to strengthen its presence in the Asia-Pacific. Middle East instability has also raised concerns in South Korea as some argue that U.S. security commitment to the defense of the peninsula could weaken. The U.S. has apparently abandoned its military strategy to fight and win in two major wars, and this could impact the way the U.S. maneuvers in the event of a possible war here, some experts noted.